Six prints associated with the Tokyo nichinichi shinbun (TNS) nishikie series have no issue numbers. Following Tsuchiya 2000, I have numbered these prints 9001 to 9006. Two of the these unnumbered prints -- TNS-9001 and TNS-9002 -- have Stage 2 banners and are otherwise associated with events that took place during the months that numbered Stage 2 prints were published. As Stage 2 prints, both are part of the main TNS series -- which includes Stage 1, Stage 2, and Stage 3 prints. Though both were drawn by Yoshiiku, TNS-9001 was published by Gusokuya, while TNS-9002 was exceptionally published by Hirooka Kosuke. Three of the other unnumbered prints -- TNS-9003, TNS-9004, and TNS-9006 -- have Stage 4 banners, though each banner is somewhat different. All were drawn by Seisai Yoshimura and published by Gusokuya. The other unnumbered print -- TNS-9005 -- was published by Gusokuya, but was drawn by Hayakawa Shosan and has no cherub banner. Among the five nominally Stage 4 prints -- which as a group are not part of the main TNS series -- this print is a candidate for exclusion from the TNS series. 1. The data in this table was compiled by examining the prints in Tsuchiya Reiko's Nihon nishikie shinbun shusei (Tokyo: Bunsei Shoin, 2000), a CD-ROM containing large scans of practically all known news nishikie. 2. TNS-9003o is a well-known print, copies of which are found in several collections (including Waseda University and University of Tokyo). TNS-9003r was first shown at at an exhibition of TNS and YHS news nishikie at the Chiba City Museum of Art in 2008. The information shown here is based on an examination of the print at the exhibition, its image and particulars in the CCMA 2008 book, and conversation with its owner. 3. TNS-900X are all unnumbered prints. Related files for all prints, except TNS-9003r and TNS-9004, are named "TNN-1234" on Tsuchiya 2000 (Bunsei Shoin CD-ROM). Tsuchiya "TNN" to designate "Tokyo nichinichi shinbun" nishikie files. Note, however, that I have reversed the numbering of the last two unnumbered prints on the CD-ROM, hence my TNS-9005 and TNS-9006 correspond to TNN-9006 and TNN-9005. TNS-9001 is a Stage 2 print that did not get numbered -- drawn by Keisai Yoshiiku, carved by Watanabe Horiei, and published by Gusokuya. The story is unsigned, and there is no approval seal. The story is about a shizoku named Yoshioka Ryotaro, age 21, who came to Hyogo prefecture from Tottori -- which, the story remarks, was the birthplace of the infamous Shirai Gonpachi -- and adds that Yoshiioka was no inferior to Gonpachi when it came to women. Coming to Kobe "last year" he got involved with a woman named Ofusa [Ofuki], the daughter of restaurant owners. They had problems, he stole a sword, and ended up killing her and her parents. He escaped, people gave chase, and he was about to commit seppuku when a friend from his village talked him out of it. He was executed on "the 13th day of the 9th month of last year" -- which could mean either 1873 or 1874, since Stage 2 prints date from mid-October 1874 to August 1875. The print has no issue number, and no one has been able to find a source story. TNS-9002 appears to relate a Tonichi story -- but the source of the story of victory depicted and told on this triptych has yet to be confirmed. The print was drawn by Ikkeisai Yoshiiku -- which might have been guessed even if it were not so signed, as the soldiers take after so many other Yoshiiku characters. The story, in a box cartouche, is signed by Tentendo Shujin. No carver's name appears on the print. There are two aratamein -- both of the "rotated ju" (Ｘ) type, which signify October 1874, and apparently the later part of the month (see "TNS Cherubs and Seals"). What is most interesting about this work -- and what makes it an exception -- is that it was not published by Gusokuya. Below each of the two approval seals is the familiar "Hiroko" (広幸) seal of Hirooka Kosuke (広岡幸助). Hirooka (1829-1918), one of the founders of Nipposha and Tokyo nichinichi shinbun, was also a veteran nishikie publisher who had been working with Yoshiiku and Jono Denpei (writing as Sansantei Arindo) for many years. While carrying out his duties at Nipposha, Hirooka, like Yoshiiku and Jono, continued to work in the trade he had plied before becoming a newspaperman. Or, more likely, all three saw their newspaper work as an extension of their trades in a new direction. It was, after all, their mastery of publishing, drawing, and writing that enabled them to launch Tonichi in 1872. Note that Hirooka's seal appears with the approval seal. This is highly significant because it was the publisher's job to obtain the approval seal on keyblock proofs before publication. And most such seals appear near the publisher's seal or logo. The question, then, is why this triptych -- of all the prints that bear the familiar TNS banner -- was exceptionally published by Hirooka and not Gusokuya. A clue to the answer is in the title: 日報社臺灣記事 / 石門口勝戰之圖 (Nippōsha Taiwan kiji / Sekimonkō shōsen no zu) or "Nipposha Taiwan article / Picture of victorious battle at entrance of Stonegate". The only reason to put "Nipposha" in the title -- and to feature it in the "pole position" as it were -- has to have been to draw patriotic attention to the company. Gusokuya prints drew attention to the TNS series as Gusokuya products -- but this print draws attention to Nipposha as a staunch supporter the Taiwan Expedition. The the "rotated ju" (Ｘ) at Stage 2 banner make it likely that the keyblock was produced in the latter half of October 1874 -- five months after the date the story claims the depicted incident took place. This drawing shows the aftermath of the Battle at Stonegate triptych published by Gusokuya (TNS-712) about the same time. It portrays, in very vivid colors, Japanese soldiers carrying severed heads of enemy dead as one might carry water melons tied in rope. The left print shows a head skewed by a lance that rises to, and breaks through, the red border at the top of the print. Tentendo Shujin, otherwise known as Takabatake Ransen, who wrote for Tonichi, and also wrote most of the stories on Gusokuya's TNS nishikie (but not No. 712), gives the date of the action in the story as 21 May 1874. He writes that 30 some natives were killed, including their chief, by about 200 elite troops, who severed the heads of 12 and otherwise displayed the headiness one gets from victory. The article begins with a reference to the slaughter of Ryukyuans a few years earlier. It would be just like Yoshiiku to leave it to us to imagine that there is another head, just out of sight, on the point of the lance to the very left. But in fact, there are exactly 12 heads in the picture if you count and look for ears. One writer remarked, in "The publisher of this work is "Hirookaya Kosuke", and as of now a Gusokuya edition has not been discovered" (CCMA 2008:40). One won't be, as there is no evidence on the print that it was ever a Gusokuya product. There are two versions of TNS-9003 -- and original and a revision. I am numbering and titling original "TNS-9003o Tokyo Shianbashi incident" and the revision "TNS-9003r Kumamoto Anseibashi attack". TNS-9003o is the first truly Stage 4 TNS nishikie. The drawer of record is Ito Seisai (伊藤静齋), who signs as Seisai Yoshimura (静齋芳邨), the carver is Horiko Yata (彫工弥太), and the publisher is Fukuda Kumajiro (福田熊次郎), the owner of Gusokuya. The story, in a box cartouche, is unsigned. An notification (otodoke) stamp reads Meiji 12 (December 1876) but the space for the day is blank. The stamp -- and the disclosures of the legal names and address of the publisher and drawer -- reflect the new printing-matter regulations that came into effect from the fall of 1875. The story is entitled "Shianbashi no boto jiken" (思案橋の暴徒事件) or "Incident of rioters at Shianbashi" and reports that this "Rioters incident at Shianbashi" occurred in Tokyo on 29 October 1876. The picture shows police and civilians battling each other with swords at a bridge called "shian" (consideration). The bridge was located in the Koamicho 19 area of Nihonbashi in present-day Chuo ward. It crossed the East Canal that drained into the Nihonbashi river and was lost when the canal was filled. According to folklore, the name devolved from the fact that people would hesitate at the bridge before crossing it -- wondering whether, when they got to the other side, they would see a play or seek pleasure in the pleasure quarters. The Shianbashi incident occurred on 29 October 1876, on the heels of three other notable run-ins between restless shizoku and authorities: the Shinpuren rebellion in Kumamoto, on or about 24 October, the subject of TNS-9004; the Akizuki rebellion, also in Kumamoto, on or about 27 October; the Hagi rebellion in Yamaguchi, also around 27 October, the subject of TNS-9006. While Tokyo may seem a long way from the southwestern provinces where most of the other civil outbreaks took place at this time, the events at Shianbashi were directly related to those in Kumamoto and Yamaguchi. TNS-9003r is an interesting alteration (改竄版 kaizanban) of TNS-9003o entitled 鹿児島暴徒等熊本県安政橋夜討圖 (Kagoshima bōtō ra Kumamoto-ken Anseibashi youchi [no] zu) or "Drawing of night attack at Anseibashi in Kumamoto prefecture by Kagoshima rioters". The original story and title were changed to one about a night movement near Anseibashi (Ansei bridge). Saigo Takamori and his Satsuma army, which had left Kagoshima on 15 February 1877, surrounded Kumamoto Castle on 21 February 1877. Early in the morning of 8 April 1877, a contingent of government troops led by Major Oku Yasukata (奥保鞏) snuck through the rebel line along the Shiragawa by the castle, and forded the river about one-hundred meters upstream from the bridge (also known as Yasumibashi). Oku's force succeeded in provisioning the troops in the besieged castle. Saigo's forces were routed, and the castle, liberated on 15 April. By fall, "the last samurai" and the rebellion he somewhat reluctantly lead were dead. The only known copy of this print is in the Rikken Collection. It was publicly shown for the first time at the "Bunmei Kaika no Nishikie Shinbun" (文明開化の錦絵新聞) exhibition at Chiba City Museum of Art in 2008. See comments on the CCMA 2008 exhibition under "Exhibition flyers" in the Bibliography section, and see review of the related CCMA 2008 book in the "Articles" section. This, too, is a true Stage 4 print designed by Seisai Yoshimura (静齋芳邨) and published by Fukuda Kumajiro. 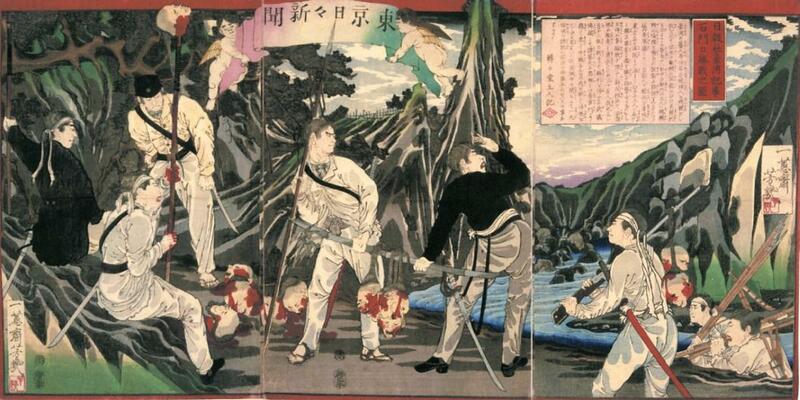 The title is Kumamoto kenka zokuto taiji no zu (熊本縣下賊徒退治之圖) or "Drawing of defeat of Kumamoto prefecture rebels". This triptych is listed in the tables in both Tsuchiya 1995 and Tsuchiya 2000 (Bunsei Shoin CD-ROM). The later states that the image and related data are not included on the CD-ROM, but the names of image and data files jump from "TNN-9003" to "TNN-9005" -- that is, the CD-ROM leaves room in its file numbering scheme to add "TNN-9004" in a future edition. Kanbara Bunko, at Kagawa University Library, has a copy of the triptych. It has been viewable, through the library's website, since no later than 2004, when I first saw it. A black-and-white image of the print is also shown in Konishi Vol. 7 (1977:135). This is the print reproduced in CCMA 2008 (page 10), as a small black-and-white image attributed to Kodansha, which published the Konishi series. Apparently the compilers of CCMA were unaware of the Kanbara Bunko holding. TNS-9006 is a true Series 4 TNS print. It shows the familiar cherub-borne banner at the top and has red borders. The drawer (画工) of record is Ito Seisai, who signs as Seisai Yoshimura. The publisher of record is Fukuda Kumajiro, aka as Gusokuya. The otodoke date is 22 November 1876. The carver is not indicated. The price is 6 sen. The title of the print, in its own cartouche to the right of the story cartouche, is Yamaguchi kenka zokuto tsuito no zu (山口県下賊徒追討図) or "Drawing of pursuit of Yamaguchi prefecture rebels". A second cartouche in the upper left, drawn to look like an unrolled scroll, is titled Zokuto renmei (賊徒連名) or "Rebels names". Army Major General Miura Goro (1846-1926), mounted front and center, is routing Maebara Issei (1834-1876) and his supporters to the left. This is not a true TNS news nishikie. The first thing one notices about this triptych is that it does not bear the trademark cherub-borne banner. Moreover, the red border is missing. More importantly, though, it appears to have been drawn as part of another series. Tokyo nichinichi shinbun is printed vertically, as 東京日二新聞 (not 日々), in black on a plain red cartouche on the right. The title of the story, to the right of the story in the story cartouche, is 茨城県下賊民之話 (Ibaraki kenka zokumin no hanashi) or "Story of Ibaraki prefecture bandits and people". The story is signed by Shosan (松山). Very conspicuously printed in black in a nearly white cartouche across the bottom of the middle print is 早川松山圖 (Hayakawa Shosan no zu) or "Drawing of Hayakawa Shosan". A similar cartouche adorns a number of Shosan triptychs from this period (see below). The publication particulars are in the lower left corner. The otodoke date is 25 December 1876. The drawer of record is Hayakawa Tokunosuke (早川徳之助), which is Shosan's legal name. The publisher is Fukuda Kumajiro (福田熊次郎), the owner of Gusokuya. The carver is Yata. The price is 6 sen. This print was probably not intended to be part of the TNS nishikie series as such. The cartouche bearing the name of the newspaper is no different in design than those which show the names of some of the characters who figure in the story. In fact there are other triptychs -- including one entitled Aizu gunki (會津軍記) and another called Kyushu shinpo (九州新報) -- which are borderless and have a similar "Hayakawa Shosan no zu" cartouche at the bottom. Both of the these particular prints, as described and shown in Kanbara Bunko, were also published in 1876, though by Kobayashi Tetsujiro (小林鉄次郎). Hayakawa was drawing similar civil disturbance triptychs, over his trademark cartouche, for several publishers. Only this one, by Gusokuya, invoked the name "Tokyo nichinichi shinbun" -- probably because Gusokuya was the reputed publisher of the THS series, and putting the name of the newspaper on the print would lend its story an air of authority.